10 Min Walk to the Beach.Luxury apartment, overlooking golf driving range. 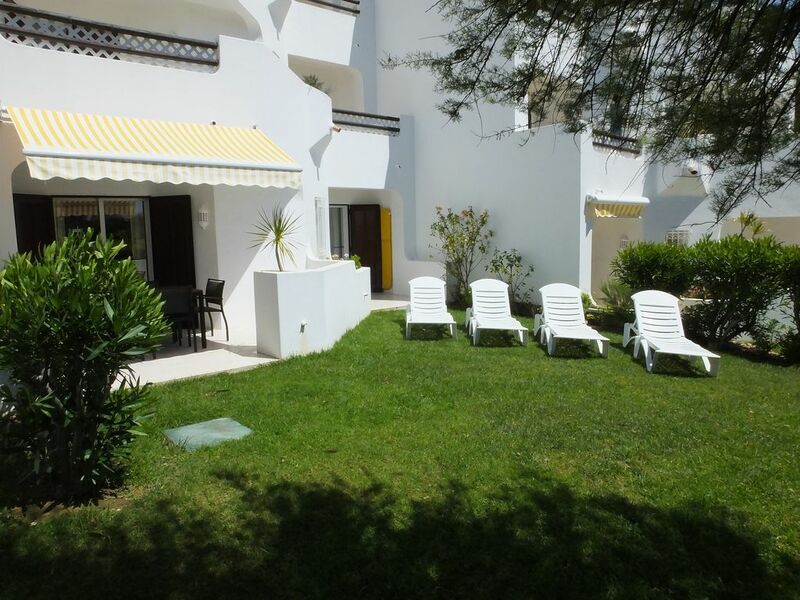 Balaia golf village is nestled amongst a 9 hole golf course between Vilamoura and Albufeira. It also boasts 4 tennis courts, 6 swimming pools, restaurants, supermarket, beauty parlor and shops and now a very new bowling green. There is also a 24 hour reception area. Here the friendly and helpful staff will assist with your requests. Whether it is for a taxi, local excursions or just general knowledge about the surrounding areas. There is also internet access available. Due to its location most of the Algarve’s treats are not far away and Spain is only about an hours drive away. We are asked on many occasions wether the apartment has AIR CONDITIINING, no it doesn't is the short answer. However we would like to point out we have never had a complaint about the lack of it. The apartment is located on the ground floor and remains cool at all times, even the extreme heat endured through the summer of 2018 where temperatures were in the late 30's. Electric fans do a very good job and are a lot healthier too. The apartment sits in a quieter area of the complex, next to the golf clubhouse and overlooking the driving range. There is a pool complex 50 meters away ideal for both adults and children. It enjoys a south facing terrace where you can sunbathe all day if you so wish, or watch the entertainment of the driving range. The apartment is in excellent decorative quality and naturally comes with all the modern conveniences. This is classed as a superior apartment by the resort and so has a fully operational kitchen and includes extras such as coffee machine, toaster juicer and microwave. There is also washing facilities drier ironing board and iron and clothes horse. The lounge has comfortable seating for up to 6 people where you can enjoy your meal or sit and watch the satellite television. Both bedrooms have twin beds are spacious and have double wardrobes where there is ample space for your clothes and belongings. The master bedroom is on suite and opens onto its own terrace. The second bedroom is served by the second bathroom. The sofa in the lounge also pulls out to make a double bed. Your valuables can be safely locked away in the built in safe. With all this going on, in and around the resort there are a lot more advantages to staying in this area. The Maria Luisa beach is about a 10 minute walk. It is a secluded sandy beach, ideal for the kids and has a restaurant for excellent meals or just enjoy a coffee or “imperial”. Albufeira is about five to 10 minutes by car and has the lot. Restaurants of all kinds, Bars a plenty to suit all ages and tastes, shops, souvenirs and at night plenty of nightlife and nightclubs for the younger generation. For the golfers Vilamoura a 15 minute drive has 6 or 7 golf courses, another 15 minutes on and you have the internationally acclaimed courses of Quinta do Lago alongside Vale do Lobo Pinheiros Altos and Sao Lourenco, an absolute golfers paradise. Shopping centres are now in abundance with nearest being Guia and several others in Far, Loule and Portimao all with 100 plus shops and eating areas. There are marinas in Vilamoura, Albufeira and Lagos and others dotted all along the coast. In Almancil there is karting for the racers, history and a castle in nearby Silves. If you want a full day out, Spain is only a hour’s drive and the beautiful city of Seville can be reached in just 2 hours 30 minutes. There is sailing, sea fishing, flying, helicopter rides, the zoo, ten pin bowling, shopping, safaris, waterslide parks, zoo marine, horse riding and much more. The choice is yours!!!!! 2 bedroom apartment next to driving range , club house and swimming pool. Tennis close by and beach a short walk. Near Albufeira night life and restaurants. Residents of the Algarve for 27 years, we pride ourselves on providing a professional and personal service. When you walk into our apartment we like you to have a feeling of cleanliness and welcoming making it YOUR home from home throughout the duration of your stay. Balaia Golf village is an established resort, offering support from their reception 24hours a day and amenities of a high quality. The location on the Algarve is central, fairly close to the airport and near many local resorts. Peace, tranquility, sports of all kinds, golf course, restaurant, 7 pools, location for beaches, shopping, Albufeira and Vilamoura and within 30 minutes of the airport, so no tedious transfers back and forth. En-suite bathroom toilet, bath with shower, bidet. Family bathroom toilet, bath with shower, bidet. Balaia has internet all over the complex. Payment is at the office. All english channels including sports, some German French and of course Portuguese. Notes on accommodation: The apartment sits in a quieter area of the complex, next to the golf clubhouse and overlooking the driving range. There is a pool complex 50 metres away ideal for both adults and children. It enjoys a south facing terrace where you can sunbathe all day if you so wish, or watch the entertainment of the driving range. The apartment is only 4 years old, is in excellent decorative quality and naturally comes with all the modern conveniences. This is classed as a superior apartment by the resort and so has a fully operational kitchen and includes extras such as coffee machine, toaster juicer and microwave. There is also washing facilities drier ironing board and iron and clothes horse. The lounge has comfortable seating for up to 6 people where you can enjoy your meal or sit and watch the satellite television. Both bedrooms have twin beds are spacious and have double wardrobes where there is ample space for your clothes and belongings. The master bedroom is en-suite. Outside: Outside are table and chairs on a patio and sun loungers on a grassed area enjoying the warm Algarve sun. Shared pool. Utility Room: Washing machine, dryer, iron, ironing board and clothes drier. Cleaning / Towels / Linen / Maid service: Mid week maid/towel/linen change is available at an additional cost. Please see options when booking. Other: Outside terrace with dining table 6 chairs, sun cover. This leads on to grassed area with sun loungers. We had a great time here. The apartment was spotless and had everything you needed. The beach really is only a ten minute walk and everything else on site. Our kids loved being able to move to other pools and we loved that there was always beds and umbrellas available around the pools. I would recommend this place and would return again. Yvonne was available to answer any questions we had and Peter was quick with returns on line, during the booking process. Thanks guys. Our job is made very much easier when we have such nice people, who are easy to communicate with, treat the apartment with respect and leave it in a clean and tidy manner. We are so pleased that your family had such a good holiday. The apartment was very well presented, bright clean and well furnished.On arrival a bottle of water in the fridge would have been appreciated, also a spare toilet roll and a bottle of cleaner for the sinks and toilets. The lack of the sun bed and mattresses was a disappointment, but still we enjoyed our holiday. Thank you for your kind review and we are really pleased that you enjoyed your holiday staying in our apartment. Other than the roll in the dispenser we did supply an extra roll for each bathroom. As we explained to you, Balaia only ever supply 2 sunloungers with their apartments but we being conscientious Owner's supply 4. Unfortunately prior to your arrival one of them went "missing", it was reported to the office and they were going to check around for us. Apartment was in a nice quiet part of the resort. We enjoyed the swimming pool which was located only a stones throw from the apartment. So pleased that you enjoyed the facilities and trust that you had a very enjoyable holiday. We look forward to seeing you again. Well maintained apartment in a quiet area of the village. Very enjoyable. Thanks Carol, sometimes people do require a quieter part of the village but you are still close to all the amenities and a very nice pool. We are glad you enjoyed your holiday. Thank you for your kind words and your desire to come back. We look forward to seeing you again. I asked for a quiet relaxing holiday and I got just that. I asked for a quiet relaxing holiday and I got just that and it came with all the comforts of home. Apartment was lovely, it was clean and had lots to offer in terms of amenities and location. The apartment is located in the quiet part of the village by the Driving Range with a beautiful pool to use very close by there are also 5 more pools around the complex which we also used. The staff on the complex are very helpful and the owners of this apartment were great for local info, arranging a private transfer and returning messages. Highly recommended. If you are happy we are happy, that's what it's all about. The Algarve has some of the worlds best beaches. The nearest is a ten minute walk from the entrance of Balaia. The Maria Luisa beach is a secluded sandy beach, ideal for the kids and has a restaurant for excellent meals or just enjoy a coffee or 'imperial'. There are marinas in Vilamoura, Albufeira and Lagos and other s dotted all along the coast. In Almancil there is carting for the racers, history and a castle in nearby Silves. If you want a full day out, Spain is only a hour’s drive and the beautiful city of Seville can be reached in just 2 hours 30 minutes. There is sailing, sea fishing, flying, helicopter rides, the zoo, ten pin bowling, shopping, safaris, water slide parks, zoo marine, horse riding and much more. The choice is yours! 15 min from Vilamoura, marina, golf and casino. 15 min from Guia shopping centre. 25 min from Faro Airport. There is a supermarket on site and the nearest bank is about 10 minutes walk. Ghia shopping which has a hypermarket and a hundred plus other shops is about a 20 minute drive. Booking Notes: For booking and further details please visit website link further down page. www.rentbalaiagolf.com Changeover Day: Arrival time is 3pm. Departure time is 11am.v If a midweek clean is required please book with the owner in advance. The rate is 60 euros charged locally. Notes on prices: Prices are for the property per week in UK pounds. Details on availability and prices can be obtained by contacting owner or logging on to their website.